Celebrity Cruises has had a popular promotion running called “1-2-3 Go!” It was offered to boost sales and allowed customers to make a choice of various things of significant value to get for free (or included with the price). Cruise lines like these types of promotions because they aren’t really discounting the product, yet they are providing a booking incentive for consumers. It’s also cost effective for the line. It turns out that Celebrity liked this promotion so much they decided to make a version of it a permanent (as permanent as anything is) part of their pricing structure. Details appeared in the July 2 edition of Cruise News Daily. Americans have something to celebrate this weekend, and we’ll do it with fireworks. Australians also have something to celebrate, and they too are doing it with fireworks. The complete story appeared in the July 2 edition of Cruise News Daily. Silversea said today they have ordered a new 40,000-ton ship from Fincantieri. 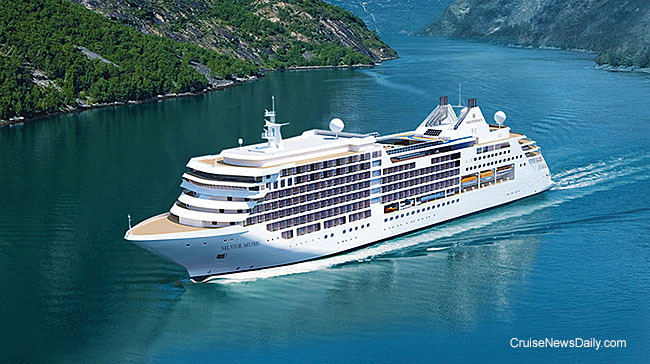 The ship, to be named Silver Muse, will enter service in the spring of 2017. The complete story appeared in the July 1 edition of Cruise News Daily. Artwork courtesy of Silversea Cruises. All rights reserved. May not be copied or used without permission. Norwegian said Nickelodeon programs will end on all NCL ships by the end of 2015. Details appeared in the July 1 edition of Cruise News Daily. The TUI Group and Royal Caribbean Cruises Ltd said today they have ordered two more ships for TUI Cruises from Meyer Turku. Holland America Line has decided to end Ryndam’s current voyage one day early on July 3 due to a norovirus outbreak aboard the ship in order to allow for extra cleaning before the next cruise. An investigation by an Italian court has closed Fincantieri's Monfalcone yard "indefinitely," idling approximately 4,500 workers. Travelers to Greece are being advised to take all funds they will need during their stay in Euro bank notes, since banks and ATM's are unavailable, and credit cards are not being accepted many places. Details were in the July 1 edition of Cruise News Daily. If there’s one thing Cunard does well (really, there are many, many) it’s celebrate its history. So get ready for an exceptional celebration of its 175th anniversary when Queen Mary 2 calls on July 10. The sailing itself is a commemoration of the first transatlantic crossing of its first flagship, Britannia, in 1840. The complete story appeared in the June 30 edition of Cruise News Daily. Norwegian Cruise Line Holdings plans to open a new sales office in Sydney to represent all three of their brands. Details appeared in the June 30 edition of Cruise News Daily. At last week’s conference call for financial analysts, Carnival had a lot to say about China. While they didn’t come right out and say it so blatantly, Carnival executives indicated that China is now serving two very beneficial roles for the company, with will continue to do so in the future. One of those roles especially is going to upset cruisers in the traditional source markets in North America and Europe. The complete story appeared in the June 29 edition of Cruise News Daily.